Although it's proudly announced the phone's rollout commenced last week, LG still hasn't unveiled when exactly you can expect the V30 to reach the United States. We hope that's going to happen sooner, rather than later, but for now there's no official word. What a new leaked promo image reveals, however, is that if you wait for the V30 you will be treated to an interesting freebie. 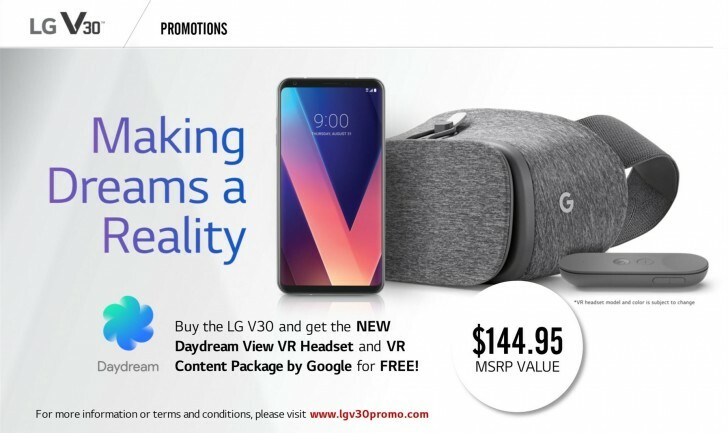 Buying the V30 in the US will apparently net you a free Google Daydream VR headset - but not the one launched last year, mind you. We're talking about the new, yet to be unveiled 2017 model which itself got leaked a few days ago. Confusingly, what's depicted in the image above is the 2016 Daydream View, but famed leakster Evan Blass assures us that LG means the new accessory, not the old one. As you can see, you will also receive a "VR Content Package by Google" which is worth around $45 (since the rumored recommended price for the new headset is $99). LG seems pretty happy to embrace Google's VR platform, now that it's finally launching a Daydream-capable smartphone in the V30. Tried waiting. I'm done. The V30 is the phone I want. But there are too many androids that are quite good. Galaxy Note 8 here I come.